When we travel we are drawn to bright, colourful places, cities, towns, historical sites and landscapes. It is hard to believe that some of these places actually exist, but they do and here are 30 of the most beautiful, colourful places on earth. Let us know which of these colourful places you would love to visit the most! As Jean Giono eloquently once said “Lavender is the soul of Provence”. Kinvara is a charming, colourful village that you will stumble across when travelling on the Wild Atlantic Way on Ireland’s West Coast. Located in Arizona, Antelope Canyon is the most visited slot Canyon in the Southwest. It is very easily accessible and is famous for its beautiful rock colours and ambient light. The Juizhaigo region of China features countless stunning natural wonders including the Five Flower Lake, a shallow multi-coloured lake whose bottom is criss-crossed with ancient fallen tree trunks. If you travel to the northern part of the Venetian Lagoon you will discover Burano, famous for its lace making and brightly coloured fishermen’s houses. Laguna Verde is a vast, iridescent blue lagoon that is overlooked by the active Licanabur Volcano which rises over 4,400 metres! I was lucky enough to see this when I travelled South America in 2013, and photos do not give it justice, the colour is truly incredible! If you are lucky you will also spot a number of flamingoes who have made this part of the world their home. This little slice of the Bahamas is one of the Caribbean’s prettiest beaches with three miles of pink sand stretching across Harbour Island. The red shells of small marine animals mix with the island’s white sand, creating the soft, pink colour! Chefchaouen is one of the most vibrant and charming towns in Morocco. A blue washed, artsy village located at the foot of the Rif mountains, Chefchaouen received an influx of Jewish people in 1492 who were escaping the Spanish inquisition and bought with them the tradition of painting buildings blue! The Great Barrier Reef, off the coast of Queensland is the largest living thing on Earth and is even visible from outer space! Boasting thousands of reefs, hundreds of islands, 600 types of coral and countless specifies of fish, star fish, turtles, dolphins and sharks. The Great Barrier Reef draws visitors from all around Australia and all over the world. A set of 5 UNESCO world heritage protected, colourful, seaside villages set along the cliffs of the rugged Italian Riviera coastline. The best way to experience them is to hike between the five villages! More commonly known as the “River of Five Colours” or the “Liquid Rainbow” this beautiful river is coloured yellow, green, blue, black and red due to the bed of the river. The 17th century waterfront, canal and entertainment district of Denmark’s capital, Copenhagen is lined with brightly coloured townhouses and bars. The Maldives are blessed with some of the most beautiful, clear blue waters in their world! They are the epitome of paradise and a honeymooners heaven! Old San Juan is the oldest settlement in Puerto Rico and is a National Historical Landmark. It is known for its historic squares, cobblestoned streets and colourful buildings. The salinity content of Lake Retba compares to that of the Dead Sea, and during the dry season it exceeds it! The pink colour is caused by a bacteria which is attracted to the salt content of the lake. The bacteria produced a red pigment in order to absorb the sunlight and gives the lake its unique pink colour! Peyto Lake is a glacier-fed lake in Banff National Park in the Canadian Rockies. It gets it’s incredible colour from the large amounts of glacial rock flour that flow into it during the summer months and is definitely on my bucket list! Yuanyang Rice Terraces date back over 2,500 years when the people who lived here established the terraces in their struggle to make a living in the difficult terrain. They are famed for their beautiful scenery and are known as ‘land sculptures’ that has been labelled a UNESCO World Cultural and Natural Heritage Site. In Spring Holland comes to life with the striking colours of flowering tulip bulbs. The Grand Prismatic Spring in Yellowstone National Park is the largest hot spring in the US and third largest in the world. Its colours match the rainbow by dispersion of white light by an optical prism of red, orange, yellow, green and blue. Brighton Beach is Melbourne’s favourite seaside destination and the 82 Brighton bathing boxes remain exactly as they did over 100 years ago. The owners have choses to differentiate their bathing boxes with minor structural, artistic and colour variations. Together they become a collective, colourful work of art! Valparaiso, know as Valpo to the locals is an art lovers dream! 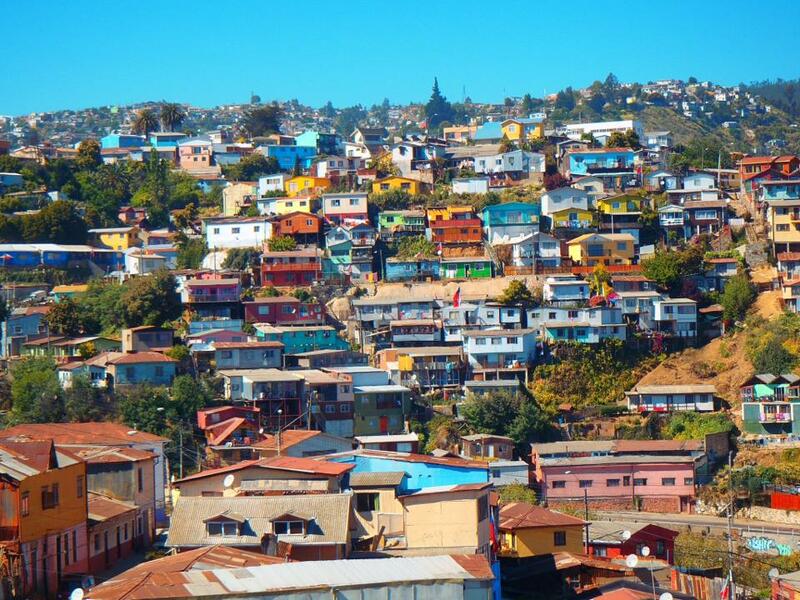 With its artistic vibe, colourful houses, muraled walls and colourful port, we fell in love with Valpo as so many had before us when we visited during our travels around South America. When I first saw the lakes of the South Island of NZ I was speechless! Their shimmering, blue qualities are due to the glacial feeds into the lakes. Lake Pukaki is set at the bottom of the highest peak in New Zealand, Mt Cook and is one of the most beautiful, vibrant places I’ve ever seen. The Bo-Kaap area of Cape Town is formerly known as the Malay Quarter. It is a multicultural area, rich in history and is known for its brightly coloured homes and cobble stoned streets. Santorini is at the top of most bucket list’s and it was on mine ever since I first saw a photograph of this picturesque island with its white & colourful buildings built into the sides of cliffs, its beautiful blue domed churches and the gorgeous blue water of the caldera that meets the endlessly blue skies. Oia is picture perfect with its caldera views, epic sunsets, pastel, whitewashed houses and iconic blue domes. Istanbul is a city brimming with colours, flavours and energy! It is no doubt one of the most colourful destinations in Europe, ranging from the awe-inspiring Blue Mosque, to the historic Jewish quarter of Fatih, to the seemingly never ending Grand Bazaar! Istanbul is one of our favourite cities in the world and is truly like no other destination. The Marble Caves of Lago Carrera are amazingly vibrant blue and grey caves that all lay in stunning turquoise waters. A part of Patagonia that is not to be a missed! The most picturesque and charming spot of the island of Procida is Marina Corricella. This thin slice of waterfront is dotted with colourful, picture perfect fishermens houses – it’s the perfect Instagram snap! The Zhangye Danxia landform area is known as “the eye candy of Zhangye” and truly has to be seen to be believed. It is a geologists dream! Trinidad is one of the most vibrant, stunning towns in the world. A mixture of cobbled streets, terracotta tiled roofs, green rolling hills, blue seas, palm trees and bright, pastel houses. It is a UNESCO World Heritage Site with carefully restored Spanish colonial architecture. What other incredible, colourful places have you visited in your travels? Let us know what we should add to our bucket list!